Facebook want you voting, all of you, but especially those of you in the States. Currently, the November presidential elections are making headlines everywhere you look, from websites to papers to the vocal chords of your local town crier. It's hardly surprising, this has already been one of the most bizarre, controversial presidential races in US history, and it's far from over. Early estimations suggest that this may well end up being the biggest voter turnout in US history as well, and plenty of work is still being done to ensure that that's the case. From this week onward, American users over 18 will all see a prompt at the top of their news feed reminding them to register. It's a nationwide rendition of something they did during the California primaries. You can't register directly through Facebook, because that would be weird and mildly unsettling, but you can register online (and frankly if you couldn't that would in itself be weird and very unsettling), and tapping the little Facebook reminder will tab you out to the government page where you can do so. In much the same way that you can share when you've actually voted, you'll be able to declare that you've registered, the idea being that you'll be spurring others on to do likewise. 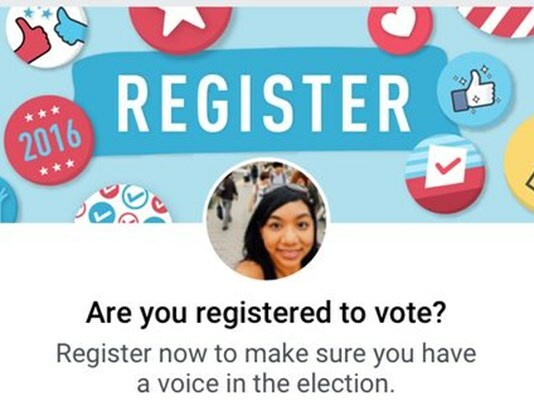 A few other platforms are also trying to encourage people to register, such as YouTube and Snapchat. In fact, Snapchat are probably winning this race at the moment, as their in-app 'TurboVote' tool allows users to actually check their eligibility and then register without ever even leaving the app. YouTube, meanwhile, is doing what YouTube does and leaving it to their prominent influencers to get more young people in on the act. Facebook have been actively involved in the voting game since Obama first became president in '08, and the scope of it has only increased since then, branching out to a number of other countries including the UK, Spain, Taiwan, the Philippines and Singapore. Going after people at the registration stage could be regarded as a more viable strategy, as people who miss the vote usually miss the registration deadline too, meaning that even if they did ultimately decide they wanted to vote, it'd be too late.